If you are a regular spring turkey hunter, then you will be familiar with the thrill of just tracking down a gobbler, the different techniques that are used to find him and lure him, and the actual bagging of your trophy. 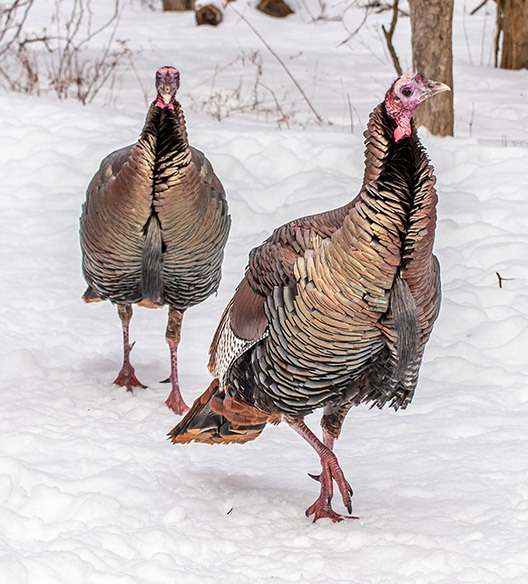 However, to be successful in turkey hunting, you need to understand the wiles and nature of this crafty bird, because even though a gobbler may have the brain the size of a walnut, he can outsmart you many times over. Basic Questions: Can Turkeys Smell? As one who is involved in turkey hunting in various capacities over the years, I have come across this question several times: “Can turkeys smell?” Other questions may also pop up like: “How developed are the five senses in turkeys?” or: “What are the most developed sense organs in turkeys?” The answers to these questions call for a better understanding of the development of the five senses in turkeys. Here we delve deeper into the issue, to conclude among other issues whether or not a turkey’s sense of smell can ruin an otherwise perfect turkey hunt or not. To deal adequately with the issue in question, we need to take a closer look at the five senses of the wild turkey. Wild turkeys use their sense of vision to hunt for food as well as to keep them safe from predators. Their daylight vision is excellent and they can make out the slightest movement, and assimilate detail in an instant. In windy or rainy weather, when their hearing can be impaired by background noise, they rely on their vision to keep a track on what is happening. Although turkeys have monocular vision (eyes at the side of the head), they overcome this through the excessive turning of the head. In fact, they are considered to be able to achieve 360° vision by rotating their heads. 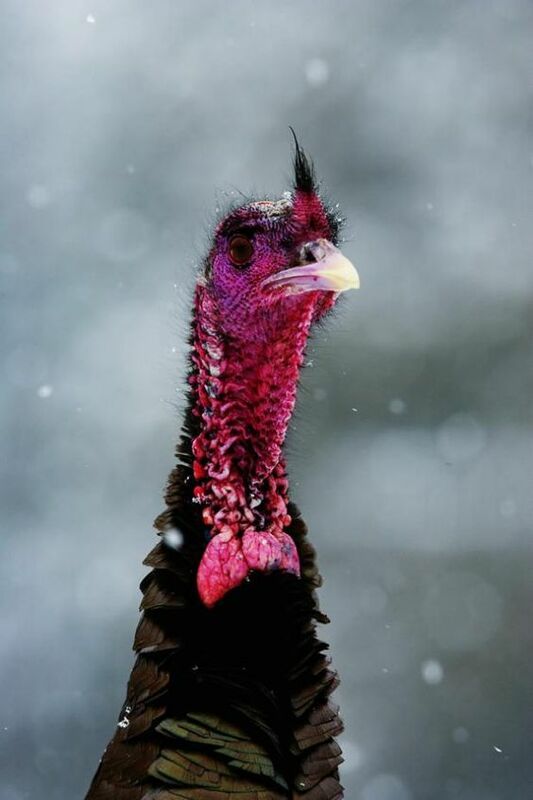 The peripheral vision of wild turkeys is believed to be better than that of humans. The sense of hearing in wild turkeys is also extremely well-developed. Their sense of hearing forms part of their defense mechanism against a predator, by being able to hear unfamiliar sounds, evaluating them as a threat and retreating to a safer area. 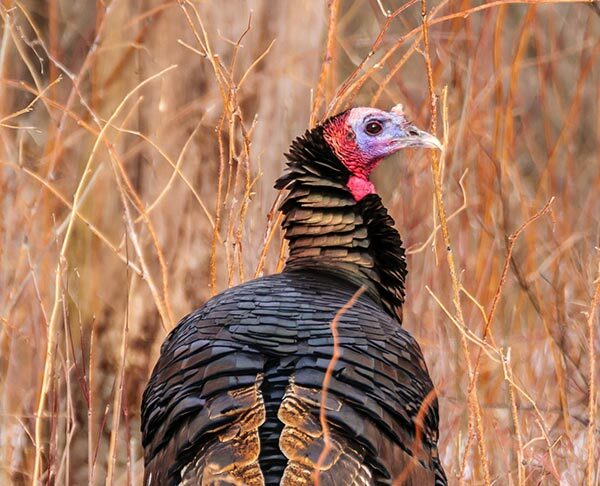 When a gobbler hears a sound, he will turn his head towards it, hence, if you have made a sound, you will know that your cover is blown, or he may be responding to a call that you have made. In fact, studies reveal that wild turkeys are able to detect lower frequency sounds at a longer distance that humans can. Although not very related to the hunting aspect of things, the turkey’s sense of touch is critical for his feeding. As the gobbler moves around foraging for food, his sense of touch helps him to scratch around. But the sense of touch in a turkey is not restricted to the extremities – the bird also uses his beak and tongue to feed, especially in distinguishing food items that do not taste good to him, or which is not safe for him to eat. 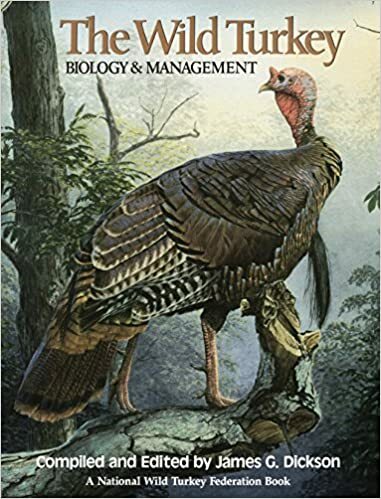 In his book “The Wild Turkey: Biology and Management”, James G. Dickson says that the sense of taste of wild turkeys is very similar to that of human beings. So, they also taste the four major tastes, sweet, sour, salty and bitter, but to a lesser degree than humans, because they have fewer taste buds. It is understood that this particular sense is not used that extensively by these birds, but however, they have been observed to discard something that tastes extremely bitter. In most animals, different smells are detected by olfactory lobes in the forepart of the brain. In dogs, this is extremely highly developed, even more than in humans, which explains the extremely sharp sense of smell in dogs. With wild turkeys, it is exactly the opposite. The poorly developed olfactory lobes in turkeys indicates that they probably have a poor sense of smell. The exceptions to this class of birds are vultures, condors, and griffons. It is always advisable to be prepared with some background information about the activity that you engage yourself, in this case, turkey hunting. Knowing more about the sense organs of turkeys will enable you to understand what to expect while tracking down a gobbler during a hunt. So, the basic questions about the 5 senses of turkeys are now answered. We can safely assume that in addition to his eagle-eye vision and acute sense of hearing if turkeys could match those with a keen sense of smell as well, chances of bagging a gobbler would be very slim indeed. 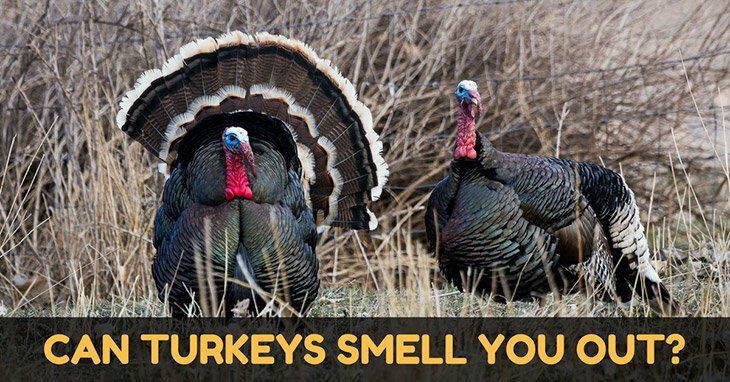 However, the saving grace is that turkeys can't smell that well, so what you need to take care of during a turkey hunt is to avoid being seen or heard. Once those two aspects are taken care of, you can be rest assured of a memorable turkey hunting experience. We hope that you have found this article useful, and if you have any questions or comments to add, please feel free to add them in our ‘comments' section. Thanks Jennifer! Nice pic. Nice article. Hi Sean, thank you so much for reading my article and I’m glad that you find it useful. What is the Best Time of Day to Hunt Turkey?